Well the plans for 2013 are underway! We met with Buffalo Wild Wings in Howell yesterday and the official date for this years Big Ten Event is Saturday June 1st! We will post more details as the event approaches but as always there will be live bands, auctions, 50/50 and plenty of food, fun and friends! Thank you Buffalo Wild Wings for helping us Give Kids SMILES For Today and HOPE For Tomorrow! See you there! My Stronger Self Raises Over $1000 for Team Kendal Kidz! A BIG HUGE THANK YOU to My Stronger Self and all of you who came out to support us! You guys are ALL AMAZING! Come on out and join Team Kendal Kidz on Thursday November 29th as our celebrity bartenders serve up a night of fun. Gnyp from 93.9 The River will be there shaking your cocktails! Come on out and join Team Kendal Kidz as our celebrity bartenders serve up a night of fun. Gnyp from 93.9 The River will be there shaking your cocktails along with other guests! My Stronger Self Fitness Boot Camp and Game Day Extravaganza! Check out our events page for more information or visit mystrongerself.com. 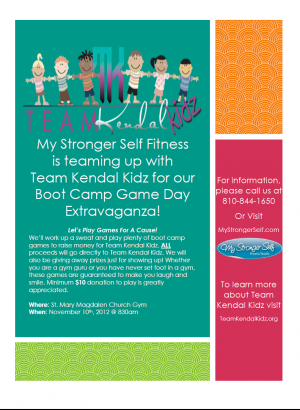 My Stronger Self Is Teaming Up with Team Kendal Kidz for a Boot Camp Game Day Extravaganza! They will be giving away prizes just for showing up! All proceeds will benefit Team Kendal Kidz. Thank You My Stronger Self! Well we ROCKED the house at the Royal Oak Music Theatre last Saturday Night! The bands were AWESOME! See Jane Rock kicked off the night followed by Seven Letters and QUIETDRIVE. Gnyp from 93.9 The River kept the night flowing in between. One of our Special Days campers was hauled up on stage to help Quietdrive perform "Time After Time". The night was full of fun and dancing all for a great cause. If you didn't purchase your tickets yet no worries, they are still available for purchase at the door. Doors open at 6:30. It is going to be an incredible night so don't miss out. See you there! Our Second Annual Concert is only 3 Days away! Tickets will be available on our site until early Saturday morning and will be held at will call. After that you may purchase them at the door. This is a great event for a great cause. By attending this event you are helping to change the life of a child with cancer. These kids NEED your help. Please help us Give Kids SMILES For Today and HOPE For Tomorrow! We Are EXCITED To Announce!!!! Gynp from 93.9 The River will be the MC for the evening at our 2nd Annual Team Kendal Kidz Concert on Saturday August 18th! We can't wait! This is going to be the event of the year DON'T Miss out. It will be a night filled with great music and fun all while helping a great cause. Spread the word we hope to see you there. Check out our events page for more information. Get your tickets now!